Welcome back to our post-race breakdown of Formula 1! MotoIQ is bringing you its own particular nerdtastic take on the latest news and developments in F1. Impress your neighbors, stun your friends, and woo the ladies with your newfound F1 knowledge! 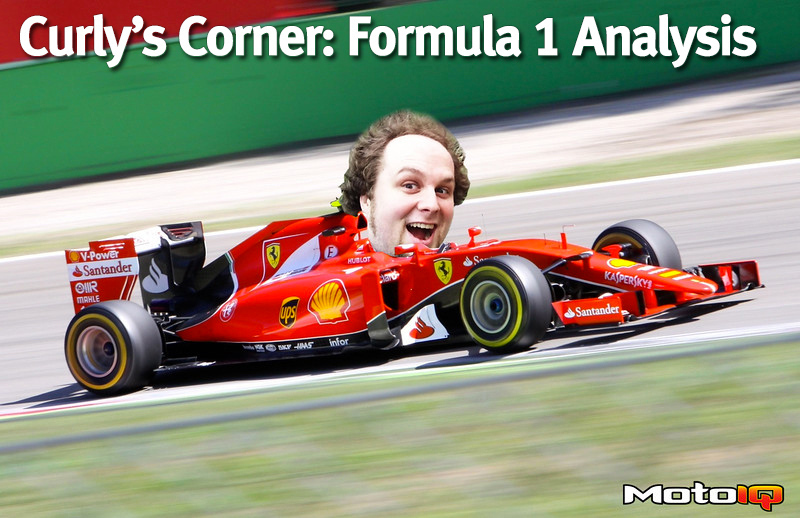 Due to a scheduling snafu, we were unable to run Curly's Corner last week, so this week you'll be getting a double feature of F1, and we will cover both the Bahrain and Chinese Grand Prixs at once. Can Ferrari Keep Up The Attack? This is going to be the key question at every round. Ferrari started strong in 2017, but faltered as Mercedes and Red Bull figured out their cars. I think it is fair to say that Mercedes is still the target to beat, but Ferrari made quite a statement by dominating in qualifying and locking out the front row in Bahrain. What was even more impressive was how Sebastian Vettel was able to defend against Valtteri Bottas on the final lap. For years, Mercedes has had a massive power advantage, and with tires in much better shape and DRS, Bottas should have dusted off Vettel before they were past the pit entrance. Instead, Vettel was able to hold of Bottas and hang onto the win. Now we all know that corner exit speed has a huge affect on straight-away speed, and Vettel likely had an advantage running in clean air. But with the DRS and a “power advantage,” that should not have mattered. Bottas still should have blown by. Is it possible Bottas blinked? Maybe, but Bottas shouldn’t be intimidated by Vettel at this point in his career. No, instead I think Ferrari really has gotten on par with their engine and has enough power to match Mercedes-Benz. Rumor has it that Mercedes’ party mode was only good for 1/10th of a second in Australia. There is no party mode in racing though. Perhaps the reduced engine supply has forced Mercedes to slightly neuter their engine in the name of reliability. It is still a very new engine (only in its second race), so there is room for improvement. We’ll see how long Ferrari can match Mercedes in the engine department. This is an important step in bringing home competition back into Formula 1. The early steps, of course, are to maintain some level of parity (to ensure the medium sized teams have at least some level of competitiveness), rules stability (to help teams converge into parity), and financial stability (so teams can survive long enough to gain parity). But, having alternate strategies available allow teams that are struggling with pace to punch their way up the grid by rolling the dice. Alternate strategies allow for some unpredictability, and that is something racing should have. Ferrari had the pace advantage, but Mercedes decided to gamble on strategy by going for a one-stop race on both cars. This gave Mercedes a shot at getting track position over Ferrari and stealing the win. 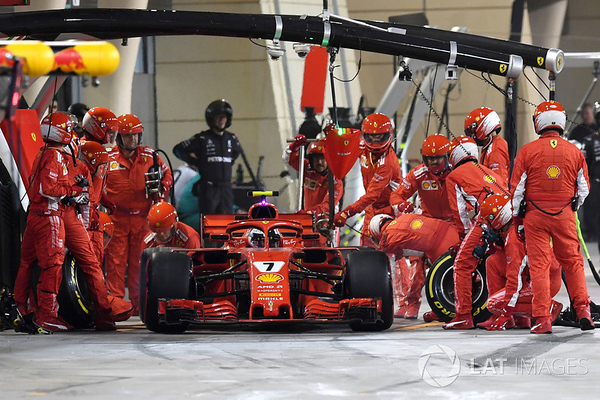 Instead, because of Kimi’s pit accident, Ferrari decided to leave Vettel on the track and let him run his tires to the cords and hope Bottas would run out of laps to make a pass. That gamble paid off perfectly. Down the field, this same rolling of the dice helped out Fernando Alonso and Marcus Ericsson. It’s quite a shame Red Bull’s race ended in just 3 laps because with them in the mix, we could have been in for an even more thrilling race, as the three teams tried to throw each other off and outsmart each other. The good news is, the top three teams were only covered by only 3/10s of a second in qualifying. Pirelli’s tires finally allow for multiple viable strategies, and with the top teams so close together, we might see a lot more mind games play out on the pit wall and give us more spectacular finishes like we saw in Sakhir. This will play out in the mid field too and should give us some entertaining racing throughout the year. Just what F1 needs after years of overly predictable races. Where The Hell Did Toro Rosso Come From? 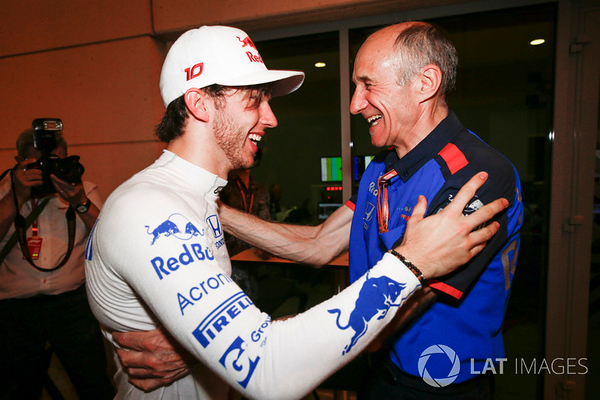 It is easy to forget about Scuderia Toro Rosso. After all, they are the clear number 2 team in the Red Bull hierarchy: whatever Red Bull Racing wants from STR, it gets. This easily puts STR on the back foot. It also doesn’t help that in most of the headlines, STR is part of are negative, whether it’s drivers being rotated out every couple of races, to the fun end of 2017 game called “Who Blows Up First, McLaren or STR?” It is incredibly easy to forget that STR is a proving ground for all things Red Bull Racing: drivers, equipment, and staff. It is also easy to forget that even though this is the “junior” team who have had a few embarrassments over the years, Red Bull doesn’t look for losers and has assembled a strong little team, despite a much smaller budget than the parent team. This was especially apparent in 2016 when STR debuted their sleek STR12 and were immediately upset…that it looked identical to the Mercedes W08! It has been said by people much smarter than I am, that if you’re upset your car looks the same as the best team in the business, you’re doing damn well! The STR 12 was quite a good car too, only missing out on 6th in the Constructor’s points because of the Sainz trade (and Renault's complete lack of support for STR’s engines). Clearly the concept was good, but needed a bit more refining. Bahrain showed that STR is starting to put the pieces together. They showed glimpses of promise in pre-season testing, but that promise didn’t hold true in Australia. However in Bahrain, where outright power isn’t as important as a good chassis, STR was finally able to strut their stuff. A major piece of the puzzle was a new floor to the STR13 that really helped tie the chassis together, the results of lots of work in Faenza paying off. Also able to show off the results of years of behind the scenes work was Honda. Remember 12 months ago when Stoffel Vandoorne didn’t even make it to the grid with a failed cooling system? And, Alonso pulled into the pits with two laps to go (with an issue that was never really disclosed) at this very race? Honda remembers. There is no doubt a bit of chuckling back in Suzuka now that two races post-McLaren, the Honda engine is finally starting to look usable. STR and Honda are practically made for each other. Both have been dealing with high profile headlines that were less of their own making and more to do with their overbearing partners. Both have a score to settle: Honda with McLaren and STR with RBR and Renault. STR especially needs to prove to Red Bull that they are a sound investment and worth the money the Red Bull company pours into the team (pun intended, and estimated at around $100 million a year). Both need to prove they aren’t just bit players in F1. Are all the pieces there to challenge the Top 3? Goodness no. The pieces might not even be there to put in a sustained charge for 4th best (despite Pierre Gasly’s successes so far, Brendon Hartley has barely made a dent in the time sheets), but STR is looking to be more a threat this year than ever before. If I was a betting man though, I’d look to Gasly to be the first, and maybe only, driver to make it on the podium outside the top 3 teams in 2018.